Notoriously eccentric, Doug Ashton's Chaplinesque clown character is widely regarded to be one of the funniest ever to appear with the Ringling Bros. and Barnum & Bailey Circus. He also appeared on several Shrine circuses and enjoyed a long run at Knott's Berry Farm while here in the States. He appears in this clip with "His Gal Sal" (his beautiful and talented wife Sally) from Royale Super Circus in his native Australia. Doug Ashton and Michael Karp both joined Ringling at about the same time that Freddie Freeman retired. Doug Ashton's makeup and costume were very different in '66 and '67 from what his character evolved into. I wonder if there was any conscious "passing of the torch" from Freddie to Michael and Dougie? JACKIE LE CLAIRE: Happy 80th Birthday! Larry H. writes in to tell me that congratulations are in order. 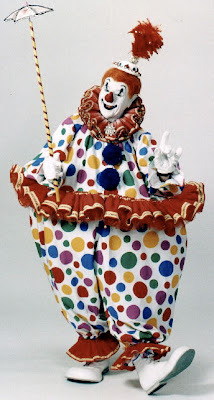 According to his records former Ringling great (and according to some sources the STAR clown of the Ringling European tour), International Clown Hall of Fame inductee and current Circus Sarasota "Ambassador of Mirth" Mr. Jackie LeClaire turns 80 years young today. Very happy returns of the day, Mr. LeClaire. Your friendship throughout the last 10 years has helped me immeasurably and your impressive body of work (and that of your father) continue to serve as an inspiration to the next generation of clowns. Here it is again: The Bird Entree. I'm not sure who this is performing it. They do a masterful job with the material but it's still not my favorite routine. I've got one more version around here somewhere that I have to track down and post here for comparison. 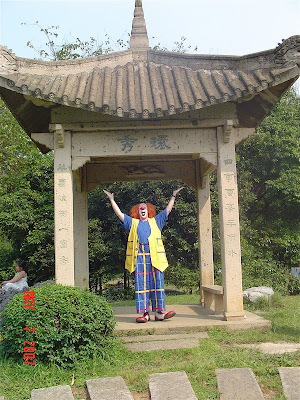 I'm finally home again after the enormous Happy Liuzhou International Clown Festival in Liuzhou, China. I'll post some photos and some video from the festival in a few days, after I've had time to decompress. Right now my son Shane and I are going to see Spiderman 3. Sorry, it's EXTREMELY hard use blogger from China.